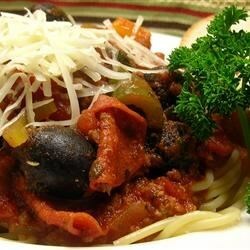 "Tired of the same old boring spaghetti sauce recipes? I invented this one to satisfy my craving for a meaty, flavorful sauce. Serve with your favorite pasta, topped with grated Parmesan cheese. Freeze the leftovers for a quick dinner another night!" In a large stockpot cook the ground beef, sausage, pepperoni, green bell pepper, red bell pepper, garlic, onion, carrots and celery. Cook until beef is no longer pink. Drain into a large colander to drain grease. To the large saucepot, add the mushrooms, tomato sauce, tomatoes, tomato paste, bouillon cubes, bay leaves, thyme, oregano, basil, crushed red pepper, black pepper, sugar, and beef broth and stir well. Pour the meat mixture into the pot. Bring to a boil, reduce heat and cover. Simmer for 2 hours. See how to make a hearty tomato sauce with beef, pork, and pepperoni. Turn this into a yummy chili: Add a 1/4 cup of chili powder, 1 teaspoon cayenne pepper, an 8 oz. bag of cheddar cheese and 3 tablespoons of hot sauce, and you've got a great chili here. This was pretty good and certainly quite different from my 'stand by' recipe. The only thing I changed was I used brown sugar instead of white. This recipe is worth the effort. This is the best spaghetti sauce I've ever had! This is a keeper, thanks for sharing!